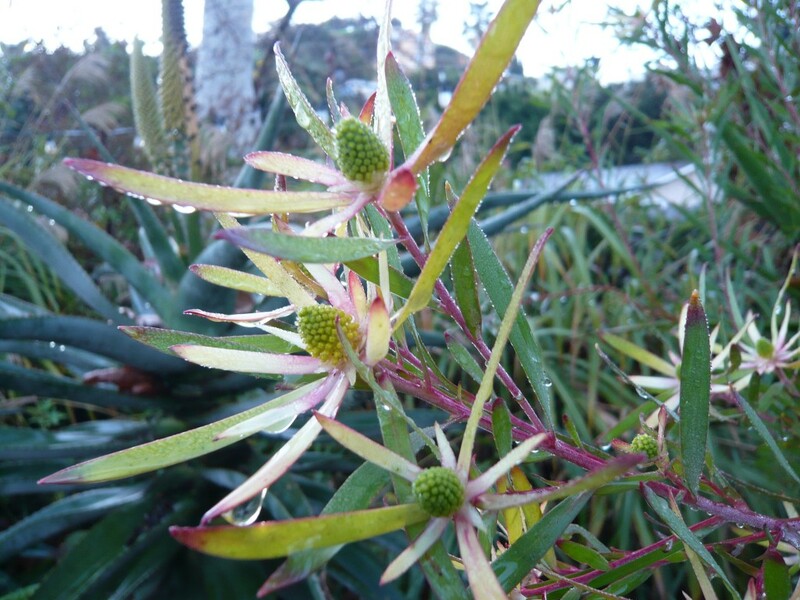 The Germinatrix » Blog Archive » It’s a Leucadendron, That’s What! It’s a Leucadendron, That’s What! 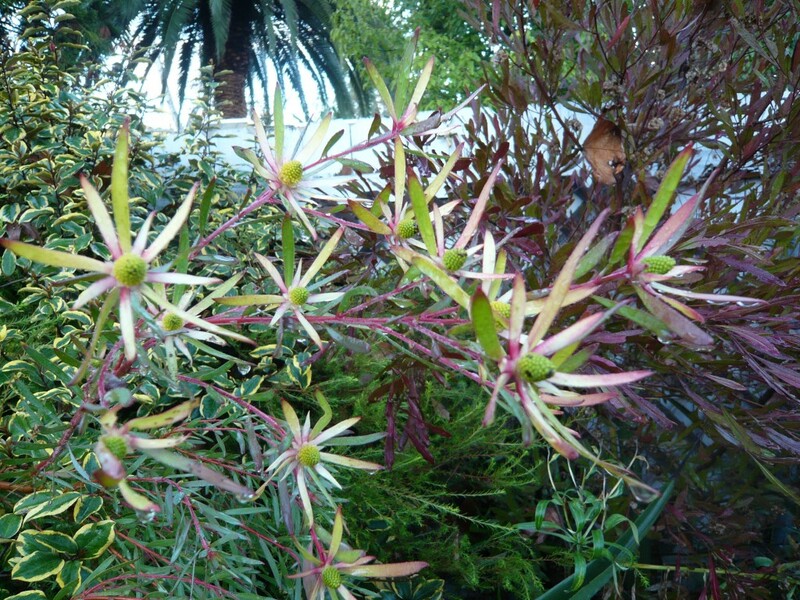 There is a shrub in my garden – a particular shrub that I let go a little crazy. It wants to be big and lazy. It wants to lay its stems on my Agave wilmoriniana, it tries to bear hug my Aloe hybrid ‘I Don’t Know What’. for most of the year it is just a pushy, leafy thing – and then it starts to shine. Somewhere around the New Year it changes its character. The new stems are red and the leaf tips blush crimson. This year I noticed that my back yard garden is actually set up to be a winter garden! How funny that I’d never noticed that before – since the backbone of it is succulents, grasses, and evergreen shrubs, it always looks strong. But when other people are enjoying their roses and irises, their lilies and other assorted spring and summer flowers, my garden is trucking along on it’s structure. I can get jealous. But then I think about the fall, when my giant miscanthus raises it’s feathery blooms, and winter, when the aloes start spiking, and early spring, when the leucadendron does its thing and takes my breath away. The fact that my Leucadendron and my hybrid aloes bloom simultaneously is a thrill – and should tell you EXACTLY what kind of flower hater I really am. Really. Who could possibly be a hater when confronted with all of THIS? Gorgeous! I’ve been wanting something from the proteaceae family for a long time, but never picked one up. For once I don’t have to be jealous when seeing your fabulous garden because I just got a Leucadendron of my very own!!! Thank god for Cistus Nursery! 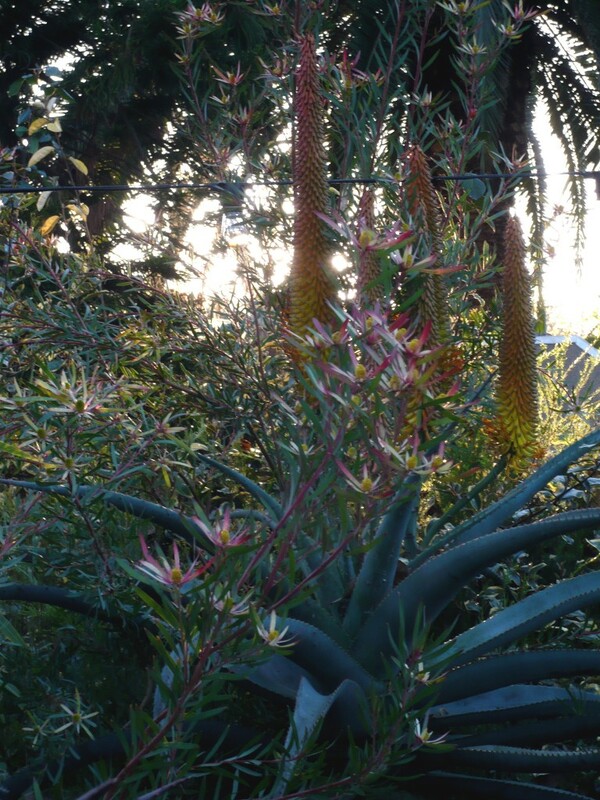 What a great combination, writes down.. hybrid aloe blooms and Leucadendron, must have! 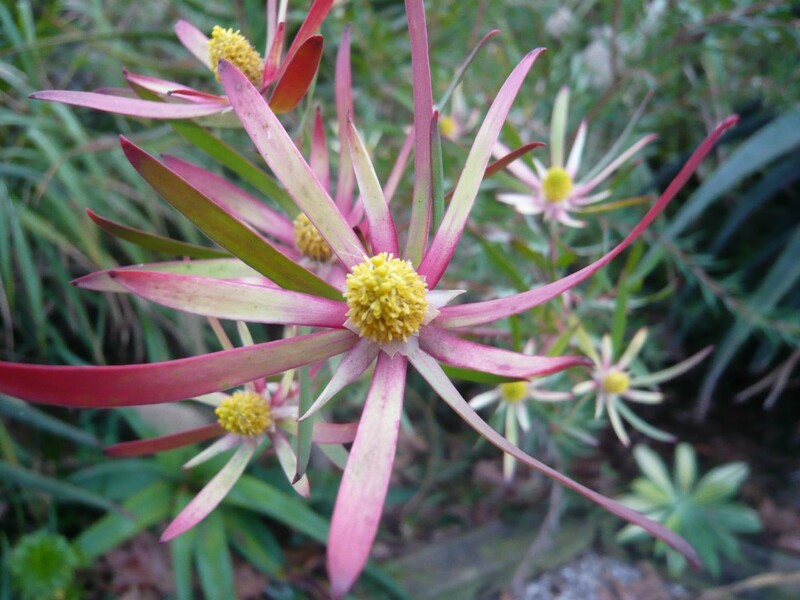 The colors pick up on each other very well and the way the Leucadendron pokes it’s nose all around your garden is great, a total rambling nosy-parker. they are fabulous…. love the foliage color. Leucadendrons and Leucospermums seem to be my passion right now. There are so many fantastic new introductions each year that I am running out of room in my garden to try them all. My absolute favorite at the moment is L. Safari Sunset. I’m using a photo of it as my banner photo on my blog, I love it so much ! Looking forward to trying this variety in a new garden this spring. Thanks for the lovely photos of inspiration. Hmm, I don’t know this plant, but, boy, it’s gorgeous. Hey Megan! Do it, get one! You’ll love it – I want MORE! I am determined to get more space in my garden SOMEHOW! I just might have to construct another level – like a two story house, but the garden version! YAY Loree! Which one did you get? I love them all – ‘Safari Sunset’ is out of this world, and so is ‘Pisa’… haven’t met a leuc I didn’t love! I could see having a leucadendron collection, too. I need farm. This plant habit is crowding me out of my home! Hi Dirty Girl -aren’t they just the best? The foliage, the stems, the way the bracts look like a sprinkling of stars descending on the garden – GARDEN LOVE!!! Michelle D., I am WITH you – but I haven’t planted any leucospermum yet. I think I’m going to put some in my HellStrip this summer. And I LOVE love love L. ‘Safari Sunset’! That is going to look beautiful on your blog. What a wonderful plant!